Photo George Nooks black and white photo shot by Floyd Celluloyd for Innermann a decade of reggae photography. Please respect the copyright. Do not use the photos without written permission. George Nooks, aka Prince Mohamed, Prince Mohammed, or George Knooks was born c.1958 in Kingston, Jamaica. A reggae singer who initially found fame as a deejay. Nooks started his musical career in the youth choir at his church, and moved on to perform at school concerts and talent shows. After first recording professionally in 1974, Nooks first found success performing under the name Prince Mohammed, as a deejay on discomix tracks for producer Joe Gibbs, notably on Dennis Brown's 1978 hit "Money in my Pocket", and "How Could I Leave", as well as "Light Up Your Spliff" for producer Prince Tony Robinson. He moved on to work with other producers such as Alvin Ranglin and Bunny Riley. His first album, a joint effort with General Echo, People Are You Ready, was released on the United Artists subsidiary Ballistic in 1978. 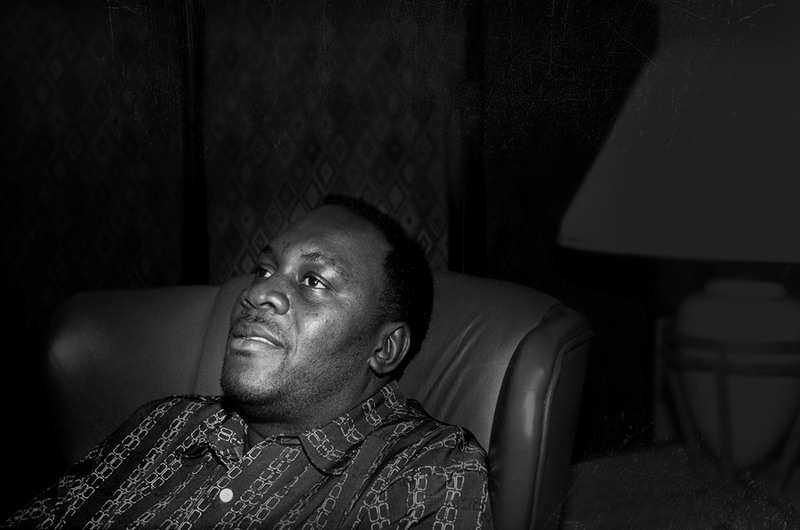 This was followed by African Roots, recorded the following year for producer Linval Thompson. He had a hit in Jamaica with "Forty Legs Dread", and the increasing violence in Kingston prompted Nooks to record a version of Little Roy's "Tribal War", now singing rather than deejaying, and released under his real name, which he followed with a cover version of Errol Dunkley's "Darling Ooh". Nooks would subsequently concentrate on his singing, releasing the "Today" album in 1981, although he reverted to Prince Mohamed in 1982 for an album with June Lodge. His singing gained comparisons with Dennis Brown, who he would later pay tribute to with a double album of Brown covers. It would be 1997 before Nooks released another album, his self-titled collection resulting in three Tamika Reggae Music awards, but since 1997 he has been quite prolific, releasing a string of solo albums, as well as albums shared with Glen Washington, Roland Burrell, Singing Melody and Lukie D. He continues to perform and record, mixing reggae and Gospel. Nooks also works as a producer, and has run his own Total Records label since the early 1990s.